Beyoncé’s Instagram feed is just as brazen as she is (See for yourself), often making the national news with her latest posts. Queen B’s Instagram, however, underscores a particular digital phenomenon – most viral accounts go viral due to television spots, PR, celebrity, or (more likely) luck. While being famous is one approach to growing your follower count, it is not what we would describe as an appropriate social media strategy for most small- to medium-sized businesses. While merely posting a video of this morning’s everything bagel might get celebrities likes and followers, good social media work on behalf of a company brand takes time, planning, and thought. You already know your company’s social media is more complex than your personal feeds (SEOversite’s Issue 18 – Heavens Where’s My Social Media). This might frustrate managers who just want to drop a smartphone in the hand of their summer intern and wait for the followers to flock. Instagram recently updated their algorithm to prioritize content users were likely to find interesting, since people were generally only seeing 30% of the content shared by those they follow, forcing companies to create even more engaging content. Instead of waiting for Oprah to retweet you, here are four things you or your social media management team can do to start improving your social media presence now. If you create an Instagram account for your bakery, how do you differentiate your feed from the millions of other bakeries on the network? All people are unique, so take a minute to think about what makes the people on your team special and create an imaginary avatar built on those shared characteristics. Assemble some writing samples and photos from yourself and other people on your team. Find the turns of phrase, words, and cadences that match your brand most closely, and post within that vernacular. Instead of coming from just another bakery, each post will be an authentic reflection of your unique brand identity. People buy from people they can relate to. While your chocolate cupcake might look similar to the bakery down the block, people may be attracted by your quirky sense of humor and choose to visit your establishment instead. Do not put too much pressure on staying on message within your industry. Irrespective of what your business actually sells, think about what interests you on a personal level and post about that. Although counterintuitive, posting what you and your employees like helps create the avatar and solidify your brand. Take this post for example. While having nothing to do with elective medical consulting, it showcases YellowTelescope’s pun loving, scooter riding, Miami Beach-living avatar. Posts like these manage to capture the interests of a fellow pun lover, even if he or she has little interest in buying what YT has to offer at this time. Now that you have established your avatar and company voice, show it off with home grown content. 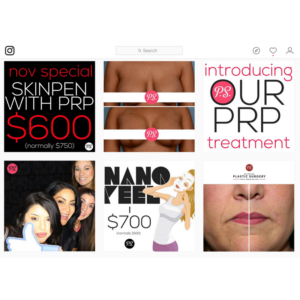 It can be tempting to select a beautiful stock photo to promote a new glycolic peel, yet think instead about snapping your own photo of the product or someone in your office using it, or maybe a picture of your receptionist’s new baby with a comment about regaining your youth. It should be within the company avatar but by using your own content you are easily eliminating the feel of inauthentic stock photography or articles. Pictures of employees, their children, vacations, charitable activities, team outings, or even just a fun day in the office feels endearing, relatable and real, increasing engagement. In fact, posts of the beautiful mugs surrounding your business have the added effect of being 38% more likely to get likes than posts without faces. Take out your phone and start snapping. There is a reason the word ‘sales’ has a negative connotation. A person who is constantly, openly, only trying to sell their services to you is simply not likable. It wouldn’t work on a car lot and it won’t work on Twitter. Think of your followers as friends not leads, focus on winning their support and warmth, and sell sparingly. Not only will your feed be more interesting, but the promotions will have a bigger impact if they are less common. This is a screen grab from one of our social media clients. While they do quite well conveying their specials and sales, they don’t let them distract from the gorgeously curated and brand-aligned feel of their feed. Like most aspects of your business, success on social media will be a team effort. Successful posts on Instagram, Facebook, Twitter, and LinkedIn will always be the ones that garner engagement, which is to say that posts only get shared on feeds when other people “like” them first. Your team should subscribe to all of your company’s feeds, like all of the posts, tag themselves when appropriate, and share them amongst their friends. Share pics of your employees and tag them so their friends see and hopefully like the post. We have seen the impact when there is employee buy-in on social media (one of our clients nearly doubled the clicks to their website from social media in just one month by getting more engaged with their Facebook content), and it can make the difference in gaining traction on your feeds. The most important thing to recognize with social media is that it takes time. It may feel counter-intuitive, since we look for immediate gratification in the likes of each post. Sadly, not all of us are Beyoncé or will ever have her number of followers. Fortunately, there is still no substitute for hard work and smart branding. If you don’t have the ability to be consistent and creative with your business’ social media, or to find out more on how we can help you monetize your presence, reach out to us at GetTheScoop@iScreamSocialMedia.com.